It has been quite a while since I have posted. My time has been consumed with health summits. Several to be precise, it all started with a weight loss summit, then along came the healthy gut summit (which was amazing), a hormone summit, and soon up is a diabetes summit. Not only that but then there is following up the speakers on there sites, plus putting into action what has been learned. I must say it has been quite the adventure. To top off all that learning I am also preparing for an upcoming brain speaks class. What fun. With all that being said, I have decided over the next little while I will keep my posts short and sweet. Consequntly that might mean just a hello and a photo with no links or explanation. Maybe even more than one photo. I will see how inspired I am. So with that being said, here we go. Next in the line up will be my mothers birthday card. 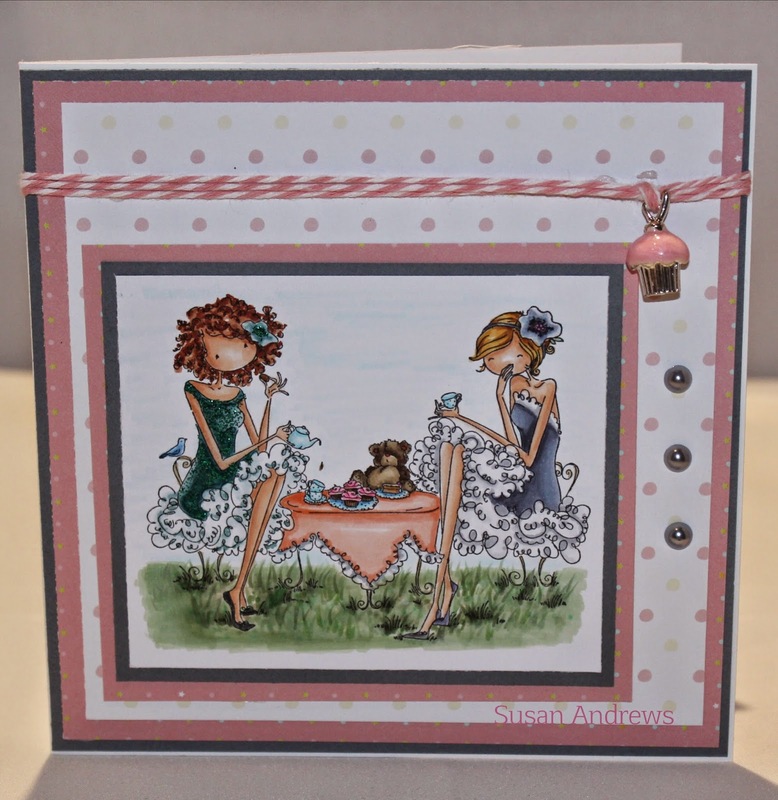 For her I used a Stamping Bella stamp called "Uptown Girl Jayden Loves to Journal". This was the perfect image to use as my mother is always writing, whether it is in her diary, book keeping or updating health records. My mom certainly keeps the pen and paper companies afloat. It has been a while. I do have many projects to share, although some are still needing to be photographed. With that being said they will not be posted in any particular sequence. I am going to start with my darling grandsons 1st birthday card. 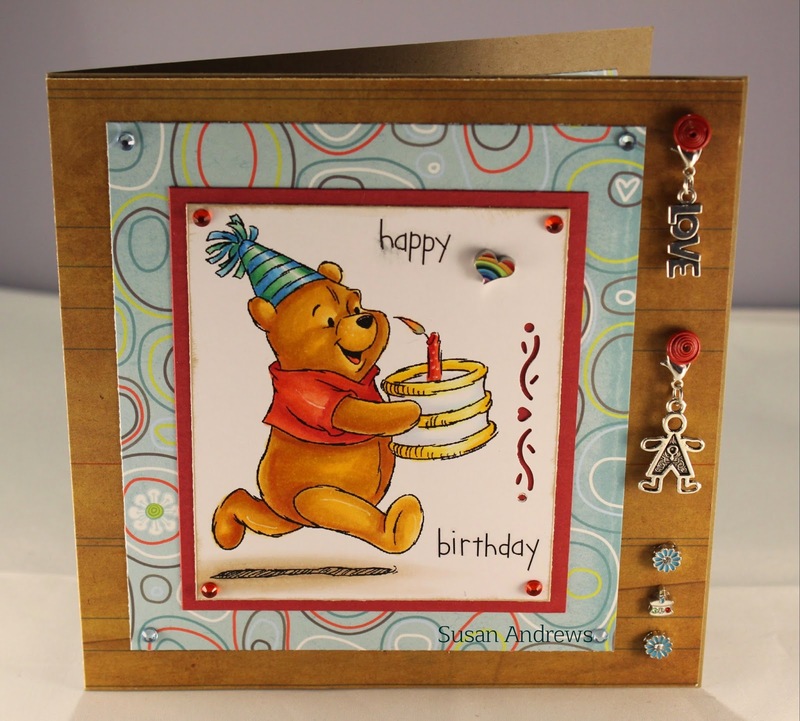 For this particular card I went with an adorable Winnie the Pooh colouring page. It is sweet, simple and perfect for a first birthday. Unfortunately the "happy" smudged a bit but I was not going to start again. Well, it was an exciting day for my husband today as it was his first day of retirement. Unfortunately for us the weather was uncooperative to go out and celebrate, yet at the same time he was glad he did not have work in it. 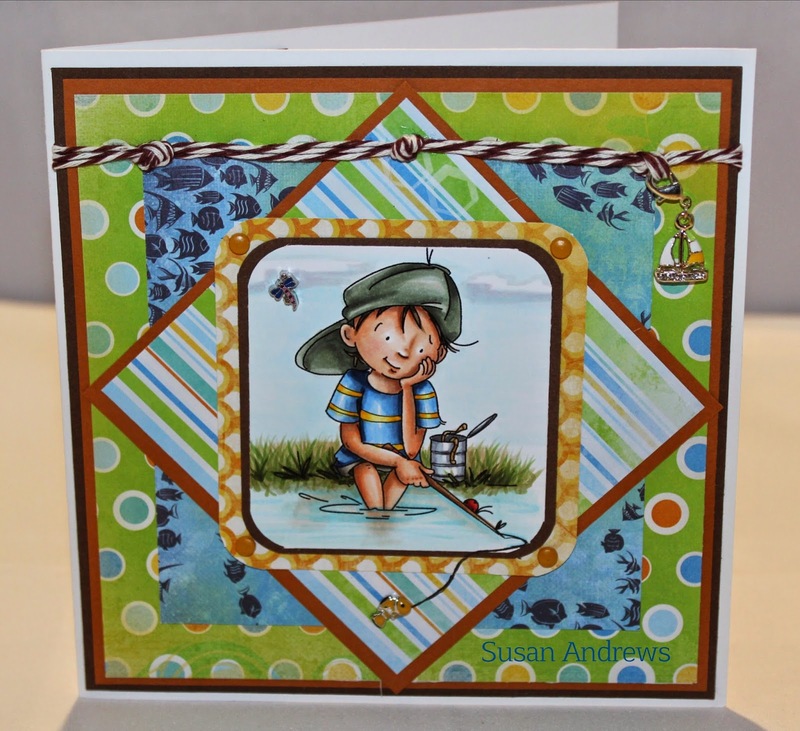 So, today's post starts off the new year with a card that came together beautifully. 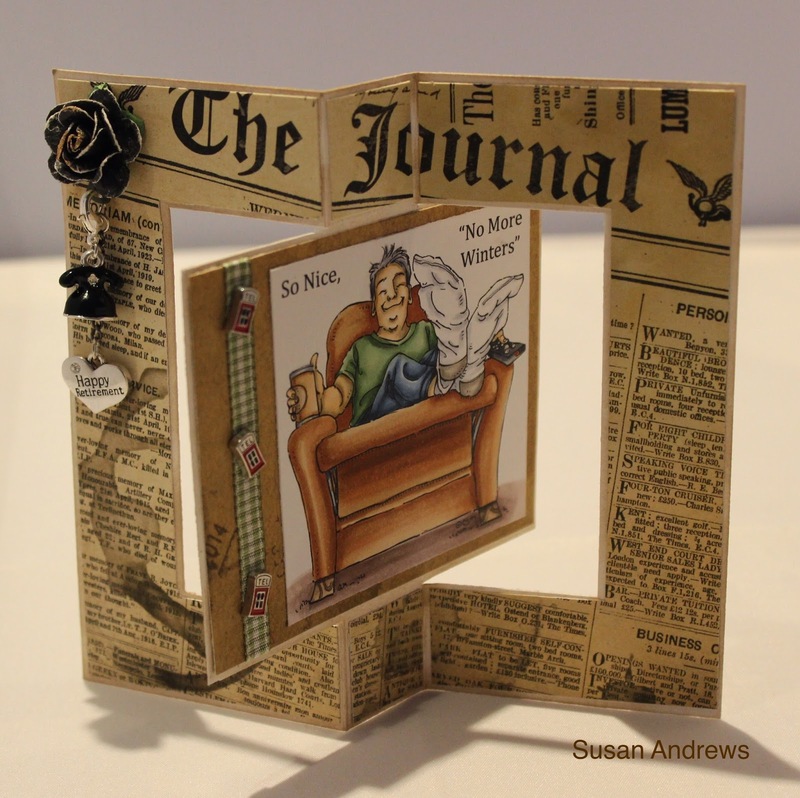 I decided to try my hand at one of the flip cards, which I originally saw on Gabrielle Pollaccos blog "Such a Pretty Mess", whom not only shares a template for making the card but also has put together a wonderful video tutorial to follow. The images I chose to use both came from Mo's Digital pencil. The first being "Extra", the young paper boy announcing the exciting news, as well as "King for the Day", a man enjoying his new position in life. 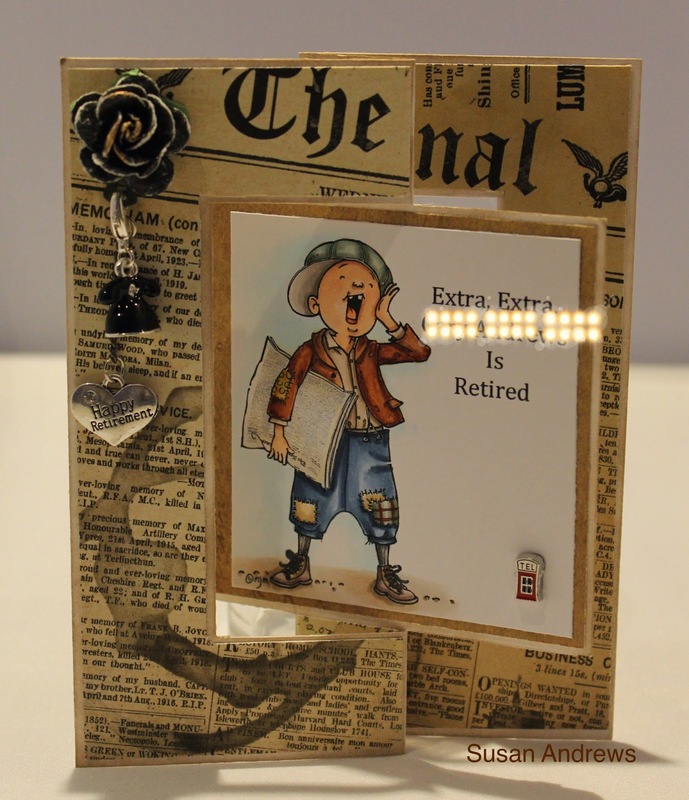 Consequently, these combined images brought the theme of the card together, along with the wonderful embellishments of a black telephone, retirement charm and last but not least the red telephone booths, a fun momento for a retired telephone man.